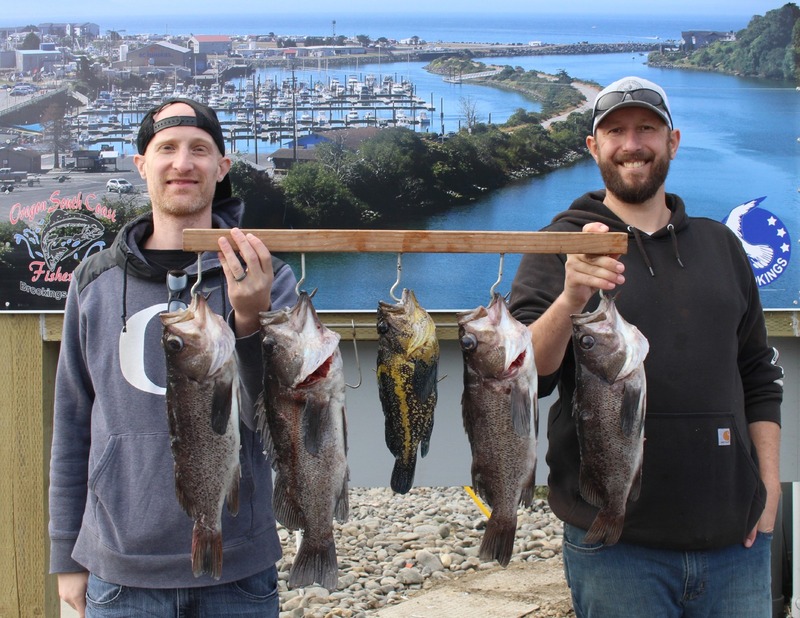 Last week, unusually flat seas and calm winds beckoned anglers to head out to the ocean out of the Port of Brookings in search for the lowly bottom-grabber. Daily limits of 5 rockfish per person commonly hit the fillet tables, with anglers catching large rockies averaging between 3 and 5 pounds. The predominant fish species was the black rockfish, although anglers caught their fare share of exotic species, including China rockfish. There were also some very large lingcod brought into the port’s cleaning station. Fishermen were wondering whether the weather would remain calm in the ocean. 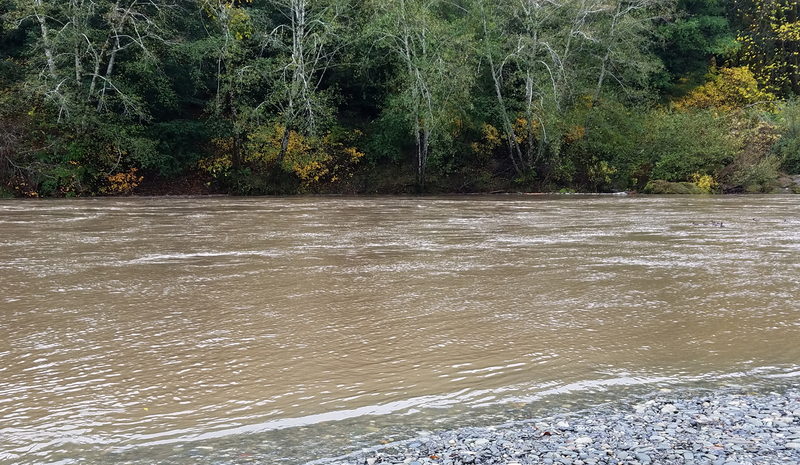 Under normal circumstances, anglers were thinking about stuffing a steelhead for Thanksgiving, but a few days before Turkey Day, folks were worrying if the Chetco would ever receive the rain needed for anglers to float the river at all. On the day of Thanksgiving, enough precipitation raised the Chetco to 2,020 cubic feet per second. That sole rise sent kings packing upriver to their happy spawning grounds. This weekend, Old Man Chetco has been predicted to rise to approximately 3,700 cfs. Later in the week, a series of storms are predicted to yoyo the Chetco’s river flows back to its normal November water levels, which should put salmon anglers back in the catbird seat. But if, and only if the bobber-fishing and fly-fishing restrictions on the Chetco are lifted so that anglers will be able to use all fishing techniques from river mile 2.2 up to Nook Creek. As this article is being penned on Thursday evening, ODFW had not yet lifted those restrictions, but I have a sneaky feeling that they will. So please keep your eyes peeled to the ODFW website at www.dfw.state.or.us. That web address will take you to ODFW’s home page. On the upper left hand side of the page, click on “News Releases”. Hopefully, a News Release will be awaiting thousands of eyes, announcing the opening of the Chetco River to all forms of angling. If the bobber-fishing restriction is lifted, anglers should have one more solid week of great salmon fishing where 25- to 35-pound Chinook salmon are quite common. And there are lots of fish that have been waiting for this rise in the river. 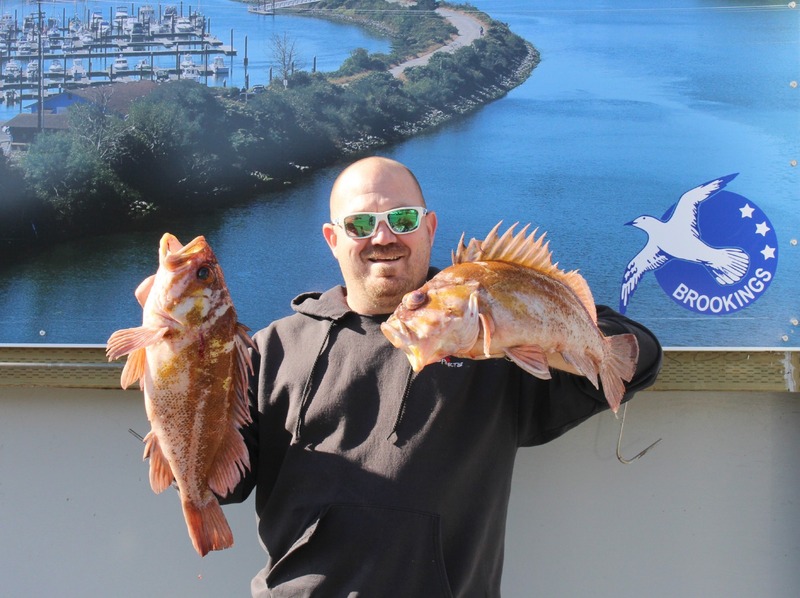 “There are lots of big arches out in the ocean,” said guide Andy Martin of brookingsfishing.com. Martin hooked several of these salmon last week while bottom fishing. All released of course. “Those arches are salmon just waiting to go upriver,” said Martin on Wednesday. And on the outside chance that the bobber restrictions have not been lifted, Martin has figured out a way of using a bobber-and-plug combination that is well within the bobber restriction guidelines. So whether the bobber restrictions have been lifted or not, anglers should still be hauling in heavy Chinook anywhere from Social Security Bar upriver toward the South Fork, including the ever-popular Loeb State Park. But probably not this weekend, as a flash-flood watch was issued for Thursday and Friday, with accompanying heavy rains and gusty winds. Here’s how the Chetco’s river flows work. After the first deluge of rain, the river usually blows out with a chocolate-brown coloration. While this is not a good time to fish the Chetco, it is a great time to tie up some leaders and get your tackle in order. The result of any particular freshet usually doesn’t show up on the Chetco from 14 to 22 hours. You will be taken to two different graphs. One graph will read the Chetco’s flows in cubic feet per second, while the other graph will demonstrate the Chetco’s water levels in feet. Normally, a particular river flow will match a specific foot marking. Most people will read the Chetco in terms of flows. As the river peaks from 3,000 to 4,000 cfs or higher, anglers will be waiting for the river to lower. As it lowers, it will also begin clearing. As it clears, it will lose its chocolate-brown appearance and take on a pea-green or slate-gray texture. When the river has between 4 inches and 2 feet of visibility, that’s the time to grab your gear and launch your drift boats. 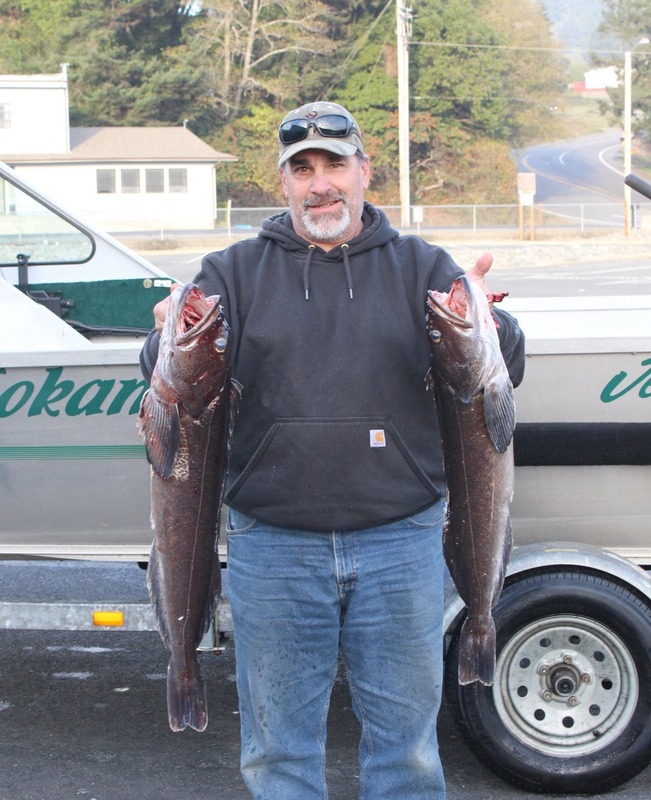 Most anglers won’t consider launching their drift boats until the Chetco is below 4,000 cfs. That 4,000 cfs figure is only a guideline. There are few anglers I know who will drift the Chetco when it is flowing a little over 4,000 cfs, but those anglers are ultra experienced and gifted oarsmen. When the river drops between 3,000 and 4,000 cfs, pulling sardine-wrapped plugs can often elicit a Chinook to bend the rod double. We’re talking plugs like the K-15 and K-16 Kwikfish and Mag Lips that are 4.5 inches and larger. From 3,000 cfs downward toward 2,000 cfs, back-bouncing roe and pulling plugs are wicked Chinook techniques. And let’s not forget that winter steelhead should be entering the Chetco starting about this time of year. For these guys, you can side-drift from 4,000 cfs downward toward 1,500 cfs, and it’s best to start out by using single Puff Balls, single yarn balls, single beads and single Corkies. The reason why using the aforementioned single objects can slant the odds of getting a hookup in your favor is because during the first or second deluge, single salmon eggs will often be dislodged from the salmon redds. It’s really the natural procession of nature, where incoming steelhead will prefer gobbling up single eggs floating away from the already-dug salmon redds, and they will be gobbling these single round objects one at a time and as fast as they can. So if you want to garner more bites from these earliest-returning steelhead, use a single round egg imitation. At the most, you will want to use one salmon egg connected by a skein trailing 2 or 3 other salmon eggs at the most. Never use a big cluster of roe for these first returning metalheads for the reason explained previously. In closing, pray that the Chetco produces water flows that neither get too high or too low, but maintain a constant flow between 2,000 and 4,000 cfs in order to keep the river flowing at its optimum clarity for side-drifting. Also, pulling the 3.5-inch Mag Lip can be the killer plug for these aggressive 2- and 3-salt steelhead. I know guides on the Rogue River who won’t carry anything else in their boats. With the salmon season having approximately one full week left in the Chetco, and the winter steelhead run just beginning, anglers never know which species will strike their presentation. The real thrill at this time of the year is not knowing which fish will be giving your rod a savage take-down.